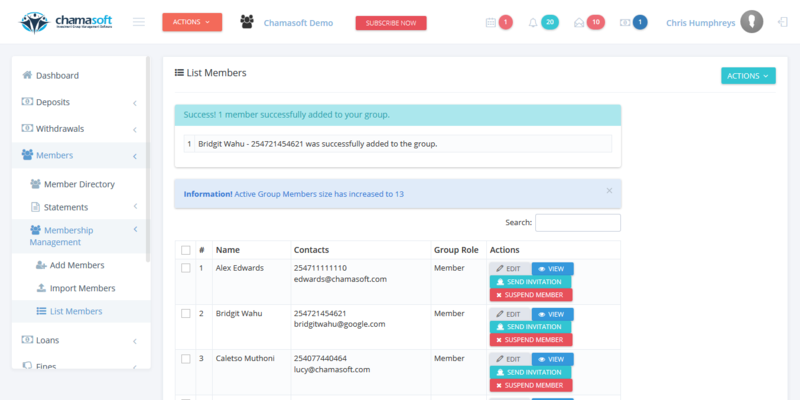 After creating an account on Chamasoft, the next step is to add members in order to create the members group accounts, this will enable them to login and view their group financials. The account holder has the ability to add an unlimited number of members to a group. To add members follow the few simple steps. On the left hand side menu, click on the following menu items; Members then Member Management and lastly click on Add members. 3.Click on ADD MEMBERS to save the member. 4. Click ADD NEW MEMBER LINE to insert a new row. 5. Once the member is added, you get a notification on top informing you that a member has been added. Now member(s) has been added to the group successfully. They will receive a notification sms and/or email informing them that they have been added. Kindly proceed to add your group financial institution account here. This can either be a bank account, SACCO account, mobile money cash account or a petty cash account. Can I change Member Profile?